Support Agencies – Murrumbidgee Primary Health Network, Argyle Housing, Health NSW, Department of Family and Community Services , Human Services, Wellways, Legal Aid NSW, Relationships Australia, Sisters Housing, Finance NSW, GEO Group Australia, Directions Health, Tumut Regional Family Services, Intereach, Wagga Family Support, Justice NSW, Work It Out, Pathways Murrumbidgee, St Vincent De Paul and Uniting Care. The growth of rental stress and homelessness across the globe has been apparent for some time now, and while the reality of either topic is not at all welcoming, the fact that both topics are now the subject of public opinion hopefully, means that something will change for the better. The Triple H – Homelessness Week Expo on August 10 is about creating awareness of homelessness in the community and trying to reduce the stigma. There is a mix of homelessness services, mental health services, health services, drug and alcohol services and community services attending to provide information to the local community of the services available to assist with homelessness and it’s complexities that a growing number of people face on a daily basis. Unfortunately all or most of the Wagga Wagga support services and community housing agencies have experienced an increase in requests for housing and support services directly from people who are experiencing homelessness. In most cases, community housing agencies work directly with support agencies to assist in providing social housing, however, of late the agencies involved have had enquiries from people who are homeless coming into the office direct from the street to ask if they can provide housing for them. Concerns that cost of living pressures are intensifying are a stark reality for many households, according to new data from the Australian Bureau of Statistics (ABS). The ABS found cost of living pressures increased for all households in late 2017, regardless of whether your main source of income was salaries, the pension or retirement savings. Over 50% of low-income earners reported some form of hardship, along with almost one in two 18 to 49-year-olds. Nearly half of those surveyed also reported they were “extremely” concerned about their current financial position, nominating paying their utility bills as the biggest impact on their financial position. 21% of respondents said they were unable to pay a bill during the survey period, followed by 18% who said they did not having enough money to buy food and basic-necessities. 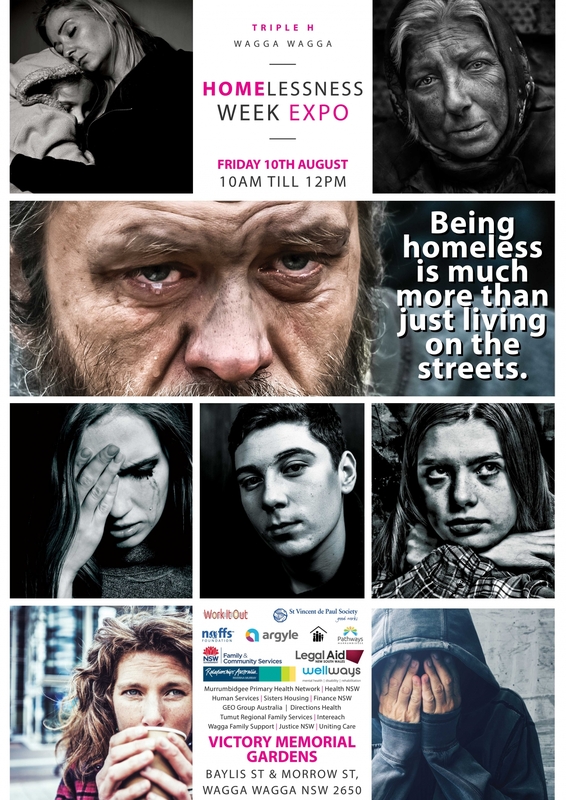 The Triple H – Homelessness Week Expo is being held to coincide with the weekly Friday Homelessness BBQ that Wellways provides. By doing this, the team at Triple H are hoping to engage with an audience that will be a mix of service providers, community members and those who are experiencing homelessness. The reality of homelessness is that it is much more than sleeping on the streets and we would like those in need that there are services to assist them.